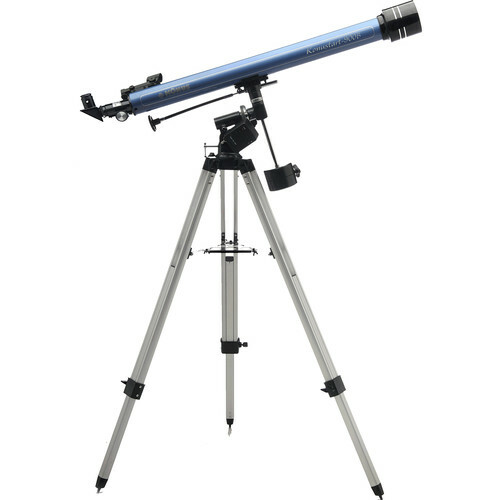 Designed for intermediate users, the Konus KONUSTART-900B 60mm f/15 EQ Refractor Telescope is designed to provide new astronomers with a complete setup for viewing the moon and planets, and brighter deep-sky objects like star clusters and galaxies. Two eyepieces provide 45x and 112x magnifications with a 2x Barlow lens that doubles the magnification of each eyepiece for a wider range of observing possibilities. Additional accessories such as a smartphone digiscoping adapter, a star diagonal, and 1.5x erecting eyepiece add to the scope's versatility and allow it to pull double-duty as a traditional spotting scope. Aperture 60 mm / 2.4"